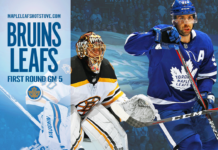 It’s an extended notes edition of Leafs Notebook this week. Seems fitting to do it during a week in which the Leafs don’t play on Saturday night. – One thing Morgan Rielly has tweaked in his game is his ability to walk the line. He has never owned the big shot, but beyond that, it took him a long time to get it off previously. I mentioned that he has developed a quick snapper earlier this season, but what is perhaps most impressive about it: While he walks the line, he doesn’t have to shuffle the puck and load it back to get it off. He can keep it on his forehand the entire time and snap it away quickly. It’s a nice adjustment that makes the most of his tools, and it makes a difference because it comes off his stick a second quicker, catching opponents off guard. This goal against Washington early in the season is a good example; he walks in with a few quick steps and keeps the puck on his forehand the whole time before quickly snapping it on net. – This season, Rielly is on pace for 201 shots on goal. His career season high is 176. For reference, only nine defensemen in the league put over 200 shots on net last season. The extra power play time definitely helps, but Rielly has also really worked on this part of his game in general. – The hold on Rielly’s stick that led to the Penguins first goal received a lot of attention, but I don’t think Babcock was happy with William Nylander’s weak back check that also played a part. It opened the game back up and Nylander played only one shift in the third period. 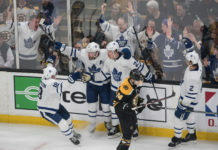 – It was classic Mike Babcock to circle back and start Nylander on the first shift of the next game (at centre no less). He set up a goal right away, but he struggled down low in his own zone, with Leon Draisaitl in particular going through him with a few minutes left in the third. For the final shift of the game, Babcock took Nylander off that line and played Bozak there instead. – I thought it was interesting that Babcock pointed out that he gave Nylander the choice to play center or wing and Nylander picked center. It’s no secret the team has two center spots opening up next season. – On the full two minute 5v3 kill against Edmonton, the Oilers put two lefties at the point. Anytime they had the puck, Leo Komarov backed off Draisaitl — who was on his strong side — and simply tried to take away the one timer. In front of the net, Zaitsev was clearing the man and they basically just dared him to shoot. There was one one-timer and it hit the post, but otherwise, it was discombobulated by the Oilers because their main play was taken away. – Conventionally, you’d think the Leafs would match their checking line against Calgary’s top scorers on the Monahan line, but they actually matched Kadri against Backlund’s line. That’s Calgary’s best two-way line, so they decided to bet on Matthews’ line in a power-on-power situation against the Monahan line knowing the Flames’ top line is weak defensively. That trio is almost more of a grinding line as currently constructed with Brown and Hyman on Matthews’ wings. It also comes at a cost; Matthews is pointless in his last three games and went without a shot in two out of his last five after never being held shot-less in his first 103 career games. – That said, Nazem Kadri got away with his own Kris Russell moment against Calgary, getting checked, falling, and sweeping the puck right in the middle of the ice to Michael Frolik with nine seconds left in a 1-1 game. Fortunately, Frederik Andersen did what he did the entire night and bailed the team out. – Great stat dug up by Alec this weekend: In the first four games of the season, the Leafs power play went eight for 24. From that point onward, they are clicking at 16.9%, which ranks 25th in the league since October 12 (27 games). In that time, they have also drawn the fewest power plays in the league (65; the next lowest is 71). I have written about this several times in the last few weeks, but the Leafs‘ bread-and-butter play on the PP is the slap pass to the bumper in the middle for a deflection. Teams are taking that away and collapsing to the slot, daring the Leafs to shoot from the outside. So far, opposing teams are winning that bet. – The arrangement of their personnel is also worth investigating. Tyler Bozak often found himself in the bumper role (this is the high screen player, just to clarify), where he put up 18 points on the PP last season. This season, he has four, including one in his last 23 games. One of the main reasons he is out of there is Patrick Marleau, who has three PP points so far this season and one in his last 27. Meanwhile, Bozak is playing on the half-wall even though he does not have a great shot in his repertoire. Teams are daring him to shoot and he’s not biting — Bozak has 12 shots on the man advantage so far. – Nylander was also elite on the PP last season, posting 26 points. That simply has not been the case this year. Teams are taking away his shot and space. It is still as dangerous as ever when he gets his shot off, but it’s nowhere near as frequent. He averaged .72 shots per game on the PP last season compared to .58 so far this year. – James van Riemsdyk actually leads the team with 28 power-play shots in 31 games. Last season, he was second on the team in the category. It is no secret at this point, but he is fantastic in front of the net tipping pucks, screening goalies, grabbing rebounds, and creating plays. – Morgan Rielly and Jake Gardiner have seven and six points on the PP already, respectively, while Nikita Zaitsev put up 13 all of last season. But I also wonder about the overall impact of having a right-handed shot up top. That impacts how penalty killing units run their handedness and overall formation, which is something I highlighted last week re: teams sagging off of Rielly because he is not a one-timer threat when Marner has the puck on the point. – The inability to draw penalties is a little trickier to get a handle on. Last season, the Leafs were 16th in PP opportunities and were also outshooting teams regularly. To draw power plays, a team needs to do a few things – drive play and drive the net, in particular. Matthews leads the team with a +7 penalty differential while Kadri is second at +5. That is near the top of the league (the NHL leader is Nikita Kucherov at +9). But the Leafs as a team only have five players with a positive penalty differential. That generally means a bunch of their guys that aren’t involved enough, whether that’s through winning battles or going to the areas where penalties are drawn (i.e. the front of the net). – In their last ten games, the team is 6-3-1 and is now on a three-game winning streak. The rest of 2017 is going to be difficult on them with eight of the next nine coming on the road, including three back-to-backs. Anyone think Babcock really pushed for this signing? The biggest factor there is that Hunwick received a three-year deal from the Penguins. Hainsey has worked out in the top four so far and the organization has a collection of young defensemen who will be trying to break through the next few seasons, so I’d say it has worked out for everyone to this point. One thing I did not know about this entire process: Hainsey’s wife is from Hamilton, Ontario, and that apparently played a part in his decision. Marner put up three points against Pittsburgh in the next game and for my money was one of the best players on the ice. This is a short clip, but I wanted to highlight how low in the zone everyone in a Leaf sweater is and how they are inviting point shots like the one that hit the post. Obviously, the Leafs got lucky that it didn’t go in, but if they are going to collapse and let defenders walk in and wind up like that, they’re not always going to be so fortunate. There is a lot of standing around in front of the Leafs net there with little being accomplished. In general, there’s a lot of chaos and a lack of certainty about responsibilities. This is how the Leafs have looked defensively for most of the season, and it’s why they allow the third most shots against per game. 1. Looking at how poor the power play has been, I think would consider putting William Nylander on one unit and Auston Matthews on the other. This ensures there is a big shot on each unit that can be built around. PK units play off of Marner, and Bozak doesn’t have much of a shot either. Matthews and Nylander are both playing their strong sides, which means it takes an extra second, unless one can rip a perfect cross-ice pass to the other (which then, in turn, seems like an automatic goal). I’d be switching these units up. I would also move Marleau to the half-wall on the Nylander unit and have Kadri as the bumper on one unit, with Bozak in that role on the other. 2. I think you have to consider giving Nikita Zaitsev some PP time, too, just for the sake of handedness. It’s a different dynamic with a right-handed option back there. He has shown some finish with four goals already (after four all of last season), including a few where he has simply beaten the goalie clean. It’s not a knock against Gardiner or Rielly, who have both been fine on the man advantage, but handedness matters on PP setups. It creates space and opportunity if aligned properly. 3. With three sets of back-to-backs coming up, I think we should see Connor Carrick get back into a few games. I’d be interested in seeing him on the PP, as he was good there in the preseason and productive with the Marlies. 4. I think I was encouraged watching William Nylander at center and would like to see him there a little more often. Obviously, it is not going to happen with a healthy roster, but he can play the position and it can give the Leafs a good read on what to do next year as well. There is not much upcoming on the free agent market or anyone emerging from within the system that excites you as far as a regular top nine spot. I think it also helps Nylander to get a little more time and space in the middle. 5. If you want to have a grind line, I think having Zach Hyman and Connor Brown as the wingers on a line is fine. But for a top line, where you’re looking to score and surround your star with top players, I don’t think that’s the right combination or balance. I just think you are hindering Matthews offensively. Hyman is a 40-point player riding shotgun with Matthews all season, while Brown is a 40-point player right now (note: neither player hit that mark last season). There’s simply too much talent on this team to be surrounding Matthews with that.